For all the recent federal attention to regulating - and differentiating - corporate officer and director functions, a curious fact remains: state fiduciary duty law makes no distinction between the fiduciary duties of these two groups. Instead, courts and commentators routinely describe the duties of directors and officers together, and in identical terms. To lump officers and directors together as generic fiduciaries with no distinction being made between them, suggests - as patently is not the case - that their institutional function and legal roles within the corporation are the same. Such a view, consequently, undermines efforts more sharply to distinguish, not blur, the governance responsibilities of these two groups. Failure to differentiate the duties of officers, who daily manage corporate operations, from directors, who more remotely monitor corporate affairs, stems from a puzzling failure to address an even deeper issue in corporate law: What exactly is the theoretical and conceptual basis for the widespread claim that corporate officers owe fiduciary duties to a corporation and its stockholders? Hardly a week goes by without yet another Delaware decision addressing the subject of director duties. Yet, surprisingly, no Delaware decision ever has clearly articulated the subject of officer duties and judicial standards for reviewing their discharge. For persons occupying such central places of power in corporations, senior officers largely have succeeded in eluding the distinctive attention of state corporation law. The thesis of this article is that corporate officers are fiduciaries because they are agents. The argument is not that agency principles should be introduced formalistically or uncritically into corporate governance. Rather, the claim is that drawing on the fiduciary duties of agents for guidance in fashioning modern understandings of corporate officer duties - and differentiating those duties from those of directors - can provide much-needed structure to what otherwise threatens to be an ad hoc enterprise. There are at least three benefits of our thesis. First, by understanding officer duties and director-officer interaction in this way it can be seen that state law remains the primary source for establishing the basic framework of corporate governance relations, both through corporate statutes and through judge-made fiduciary duty law. With a more highly differentiated state law model of director-officer relations, recent efforts of Congress, the SEC, the NYSE and Nasdaq to impose new responsibilities on directors - in an effort to improve their vital role in monitoring corporate officers - can be seen as congruent with, rather than at odds with, the underlying state framework. The current emphasis on director independence and the special focus on various board committees - audit, nominating/governance and compensation - can be seen as an effort to develop mechanisms to aid the board both in detaching from management and in divvying up the board's key monitoring functions. Moreover, efforts by Congress and the SEC to place additional and different functions on senior officers also can be seen as supplementing, rather than displacing, existing state law-based fiduciary duties of officers. As a second benefit, our thesis clarifies immensely why courts can and should more closely scrutinize officer conduct than they now review director performance - i.e., the fiduciary duties of agents are more demanding than those of directors, especially the duty of care, and officers rightly face a greater risk of personal liability for misconduct. Heightened review of officer performance is especially fitting given that many of the recent corporate scandals involved wrongdoing at the officer level, and given that state law has been eerily silent about why officers owe duties at all, much less holding them to account. It also is important in light of the fact that recent federal initiatives aimed at improving officer performance eventually will be translated into, and will heavily influence, state fiduciary duty analysis. At a theoretical level, the third payoff, our thesis has several implications. These include our belief that we are entering an era when, due to heavier corporate regulation, the entity conception of the firm will be strengthened, as positive law, including agency law, still builds on that understanding of corporate relations. This period follows a span of perhaps twenty years when a highly disaggregated conception of corporate relations - the nexus of contracts theory - has predominated. We also believe that in the policy arguments for and against strong fiduciary duties over the years, virtually no attention has been given to distinguishing whether what is fitting for outside directors in the fiduciary duty area - relatively slack duties - is also fitting for corporate officers. Moreover, although agency law suggests greater liability for officers than directors, widespread (and longstanding) failure to understand officers in those terms means corporate law cannot as confidently assume that existing liability outcomes for officers are optimal, as might be the case with rules governing directors. We believe that, from a policy perspective, the fiduciary duties and liability rules for officers should be analyzed separately from those for outside directors. Contemporary corporate law and fiduciary discourse do not do so, however, thereby hindering attention to this subject. In the terms recently used by Professors Black, Cheffins and Klaussner to describe the state of law governing outside directors, we believe the window of liability risk for inside directors - i.e., officers - is in fact wide open, but it is thought, wrongly, to be virtually shut. © 2005 William & Mary Law Review. Reprinted with permission from the publisher. Lymon P.Q. 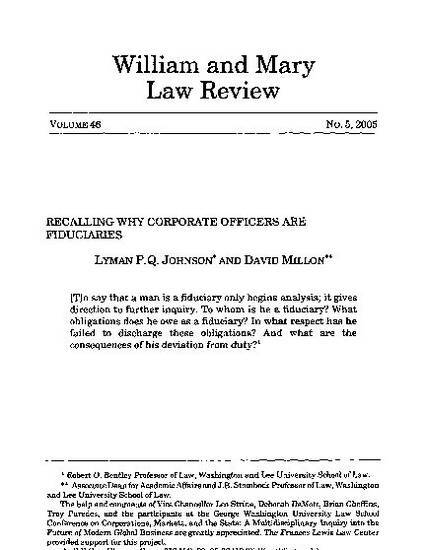 Johnson & David Millon, Recalling Why Corporate Officers are Fiduciaries, 46 Wm. & Mary L. Rev. 1597 (2005).